Last week, I attended one of the major conferences in the digital signage circuit, Customer Engagement Technology World (CETW). I have been to the conference over the span of 3 years and have seen its evolution into what I would deem, “the best conference that no one knows about.” I think one of the problems with any conference centered around technology (like digital signage) is that it can easily become a conference about the technology vs. what the technology can do. That’s what I’ve seen over and over with these particular conferences and unless it’s CES, I don’t think many people care all that much about the technology. Even then, it’s very easy to get overwhelmed. People want to see all the cool things the technology can do, but that’s a much different proposition that setting technologies out on display. 1. Lots of good thinking, but in reality, no one has figured this out– what I mean by this is that regardless what business you’re in – be it selling digital signage, selling ad space, creating content, or even putting together large campaigns that span across all sorts of technology – this is a complicated space, communicating to consumers. And despite your particular vertical or area of expertise, people are having to think about how to connect with consumers and what that means in ways that they have never had to before. There’s no one-stop-shop who can do all of this like ad agencies of old, and even more, there’s certainly not a one-size-fits-all approach that we can take when addressing this challenge of connecting with consumers. It’s just hard. There are many things to think about, not the least of which is the power that consumers have today. More than ever, consumers expect to be a part of the entire thing, they want a say in everything, from the creation to the activation and beyond. And that’s just challenging. One part of that proposition is challenging, much less all of it. So, beyond the fact that non one has this figured out, my takeaway is to put solid thinking around what it means to connect and engage with consumers in this technology-rich, two-way expected world that we live in. Think of yourself as a consumer and not as an advertiser. Think about what motivates you to engage with something when you’re living your life. And that’s only a start because that’s only you. We, as consumers, are fickle and particular and you are not exactly like me. And I want everyone to know that. 2. There’s a technology out there that can do whatever you want– whatever you want to dream up, there’s a technology out there that can do that. Gesture and touch, holograms, bendable displays. Technology is not the barrier and we’re getting to the point to where cost of technology is not the barrier, either. 3. Social should be a given, yet mobile was a key focus – I heard so many discussions that centered around mobile over the few days. There were numerous sessions built strictly around mobile. But nothing on social. That said, everyone talked about “engagement” as being an inherently social activity that it seemed to be inferred that social was just a baseline. I think for those outside the digital signage industry it is a baseline. For those within the industry, I feel like social is hardly thought about. Just from what I saw from the exhibitors alone, all playing some part in the digital signage ecosystem (hardware, software, networks, content), they aren’t focusing on social content or connections. I could be wrong, but I didn’t hear much talk about social in the customer’s journey, certainly not from the exhibitors. I would be interested to know what sort of social learning this group needs. 4. Everyone needs a life-long mentor – I love when I get a chance to go to New York because that means I get to see my very first boss in the business who is also my mentor. It is incredibly refreshing to catch up and get advice and a different perspective. He has made an indelible impact on me, in both my personal and professional life, and I’m blessed to have a mentor like that. We don’t keep in touch as much as I’d like to, but I hear his voice often, especially in situations where I need a little guidance. If you don’t have a mentor, seek one out. If you do have one, don’t ever lose them. “Uh-huh” – I sat in one session where the makeup of the panel was so un-digital-signage. Chaired by Paul Price, the CEO of Creative Realties, the panel consisted Jeremy Lockhorn, VP of Emerging Media at Razorfish, Carrie Chitsey, CEO of 3Seventy (a mobile shop), and Michael Tobin of Macy’s. All on the forefront of creating engaging experiences with emerging technologies. It was a standing room only session. It was really great to see because what it showed me was that there was interest in hearing from this type of speaker, which is a direct reflection of the different type of audience that this show is attracting. More people from digital shops and ad agencies (not media agencies). This was huge. “Duh” – There are still too many digital signage providers. And by providers, I mean companies who have some hand in everything that digital signage encompasses. I had the privilege of leading a couple of tours for attendees on the showroom floor. The tours were intended to expose the attendees to individual providers of services in that ecosystem (hardware, software, network, and content). Every single one of the attendees that I gave tours to said the same thing to me, “does everyone do everything?” Ha. Because that sure is what it seems like, if you listen to most of the exhibitors on the showroom floor. This is something that makes my head want to explode. The fact that there are so many different providers makes it confusing. Confusion for something like digital signage tends to cause paralysis. Paralysis causes no implementation. We don’t want that. As always, thank you so much for reading. I hope you have a great weekend! This entry was posted in Digital Signage, Friday 4-1-1 and tagged CETW, Friday 4-1-1 on 11/19/2011 by Mike Cearley. 4. Q & A – see Siri. 5. Recommendations – from MY friends. Only relevant-to-me recommendations. 6. Social Context – check this app, Sonar. Kinda creepy, but kinda cool. It shows you those people around you who you have something in common with, be it friends, colleagues, interests, etc. 7. Geo-gaming – like Mafia Wars but in your own real-life neighborhood. 8. Augmented Reality – I like the way he described it. “AR adds a virtual layer over the real world.” Simple, but easy to understand. 9. Near-Field Community – this is about much more than payments. Interacting with objects and places where you are. What do you think? Sound about right? This entry was posted in Digital Signage, Mobile and tagged Augmented Reality, CETW, Mobile, Social on 11/11/2011 by Mike Cearley. These are my recap notes from the next-to-last session at CETW (yay!) I know Paul very well and am always interested to hear him talk about stuff. Asif is obviously very knowledgeable about mobile – it’s always refreshing to hear from people on the forefront of actually doing the work. And with something as new as mobile, his knowledge and experience are like gold. And Bradley Walker seems to be very knowledgeable about “engagement” overall. So, while the session might not have been the most appropriately named, I still found it interesting. Screen to screen interaction – interact w/ screens that people bring with them to the screens around them. Remote controls for games – use the mobile phone to control games on large screens. Consumers today are learning new behaviors. If large companies like Apple and HP, consumers are being trained that those mobile devices are able to control other screens. Location-based marketing is about using the actual space around to deliver content/value to consumers. Location-based services are just that – services. Foursquare, SCVNGR, Yelp. Technology is the commodity, content is the asset. Location-based marketing is powerful because it can make all the content fit YOU. The size of the screen doesn’t have much impact on consumers. The message is what does. This entry was posted in Digital Signage, Mobile and tagged CETW, Customer Engagement, LBS on 11/10/2011 by Mike Cearley. CETW Session #3 – Hybrid Experiences – the Holy Grail for DOOH? These are notes recapping session #3 that I’ve attended at CETW. Excellent session because of the panelists. Agency and big brand point-of-view that this conference has desperately needed. There are many issues that the proliferation of technology has presented us all with. Operational issues, platform issues, knowledge issues – this world of marketing & communications & providing brand experiences is new, it’s fragmented and it’s happening very quickly. So people are doing what they need to do, figuring it out as they go, putting good thinking around it, but there is no 1 solution yet. This was not a panel about “DOOH,” it was a panel on “omnichannel” experiences. What is your perspective of the hybrid experience and what does it mean to you? Tobin – there are a couple different lenses that I look through when thinking about “hybrid” experiences – digital experience, physical retail – what are the benefits of both? Customers and employees are both audiences, too. Take the best of what’s happening online and the advantages of real-life, in-store and combining them. Most of their early success has been enabling associates. Have not had a lot of success with self-service (customers). One strategy for one demo will not work. Location, as it relates to brick and mortar stores is really important. Really have to think about what you’re trying to accomplish via mobile technology before you actually do something on mobile. Lockhorn – up until 5-6 years ago, we were shackled to the PC. Suddenly, we have this entirely set of new tools that we can use. Seeing radical transformation of the web brought forth across all channels and industries. Tremendous opportunity to find better ways to engage consumers. Tobin – Mobile is the bridge, but what do we owe them on the other side of that bridge? When we take it beyond the utility of the experience, what’s the magic? What do we owe them? Lockhorn – re: voice activation – this represents a broad trend now, a move towards natural user interface. Remarkable how that expectation has proliferated. People are ignoring keyboard and mouse for touch and when it doesn’t have touch, people won’t interact with it. Touch and gesture, much more engaging and interactive. Really intuitive. Tobin – re: Google wallet – benefits of mobile wallets are profound, everything is connected to YOU. It’s not about no-more-carrying-around-credit-cards, it’s all about having the potential to make YOUR experience better over time. Who do you think is doing great at bringing digital/physical worlds together? Lockhorn (and the other 2) – part of me thinks that no one is doing it well. You know why? It’s hard. There is no fully integrated solution. You have to hack things together. Chitsey – the biggest barrier is knowledge. Most people don’t know enough about mobile to do anything other than implement a campaign. Thinking strategically is hard because of these pockets of knowledge. How do you use data to do something else beyond the initial execution/campaign? The intellectual models have to change. Lockhorn – we’ve all heard about the funnel, right? Very linear process. Not that way anymore. We’ve all seen different “journey” models now. We have our own take on that. We haven’t figured it out, but got a lot of smart thinking behind it. The journey changes from category to category. Chitsey – re: SMS still relevant and here to stay – interactive text messaging is here to stay. What will be gone soon will be this 1-way push messaging via text messaging. We don’t do anything without interactivity. Tobin – put customer at the forefront of the experience and solution. Chitsey – who is the new CMO? Look at IBM deck. All of this technology is great, has lots of potential. But continue asking, especially after you do something with these new technologies – Now what? This entry was posted in Digital Signage, Emerging Technology and tagged CETW, Customer Engagement, Mobile on 11/10/2011 by Mike Cearley. These are recap notes from the Day 2 Keynote at CETW brought to us by MetLife, specifically in regards to the experience/engagement that they created at the new Jets/Giants stadium. Having been at the new Cowboys stadium and completely underwhelmed by the level of fan engagement through technology, I was impressed by what these guys set out to do from the beginning and what they’ve done up to this point. They’re continuing to push, too. Prizing central to their activity activations – instead of extending all of the perks (tickets, souvenirs, etc..) to sr. executives, they want to give those back to the fans. The key to all of the activations was technology. Engage and capture. (Partnered w/ Sapient Nitro.) Personal swipe cards (Countdown Cards), 62 touch screens throughout stadium, 34 hand-held tablets, some activities tied directly to MetLife’s FB page – all activity tied back to the cards, keeps history. For the most part, their “signage” (they have exclusive control of the content that shows up on that screen – unlike most, if not all, of the partnerships that exist) is used to advertise their prizing campaign. This is good – they’re not advertising MetLife, per se, they’re advertising the experience that they’re giving to the fans. How do we know it impacted sales? A: Overall a program trying to reach fans in new, different ways. There’s not a straight way to measure that. Measurement is designed to understand how people are engaged in the program. How do you manage brand ID? A: Needed to create a new brand – MetLife Central (for sports marketing). Superbowl in 2014? Significant factor? A: Challenge w/ Superbowl is an NFL property, not a Jets/Giants property. It’s going to be a challenge. Going to be a great media play for sure, but in terms of fan activation, don’t really know what they can do. How challenging was it to manage the content that went across all of these screens? A: Laugh. Very challenging. We had network challenges. Lots of lag. Interesting note – the question of “ROI” has come up in every session the past two days and even more interesting, no one has given a direct answer. “Depends” is the consistent answer. This answer always should match back to the objectives. What are the objectives of the initiative? Whatever those are, that’s what you should measure. And there are many ways to measure those things. This entry was posted in Digital Signage and tagged CETW, Customer Engagement, MetLife Meadowlands Stadium on 11/10/2011 by Mike Cearley. Going to talk to you guys today about communication & environment. And we’ll begin with the idea of the connected consumer – expectations are greater than they’ve ever been. Media consume, the way they consume it, etc..
It’s circular, based on decision stages, however, missing a couple of things (see Brian Solis below). Particularly, post-purchase experience, the most critical part of the journey, particularly with the open web, social media now. If the experience that a consumer experiences online is different from the experience they get when they go into a store to buy the product (or somewhere else in the real world), there is a huge disconnect for the consumer. And they tell people about it. Everything maps back to Experience. This entry was posted in Digital Signage and tagged CETW, connected consumer, Customer Engagement on 11/10/2011 by Mike Cearley. Where do you start? Going to provide you a framework. Try to avoid getting into technology first. Gotta understand customer first. Put yourself in their shoes. The last thing they’re going to be thinking about is seeing more ads. Try to understand what their needs are and then try to create an experience that fits those needs. The thing about digital signage, kiosks, mobile – make things easier for customers and provide an innate value in a physical environment. What are your customer’s expectations of you as a business? How, really, will this improve their experience? Criteria – where’s content coming from, what else can I leverage, are there infrastructure assets, content assets, database assets? What do you want to do with this particular technology? What are your objectives? And how are you going measure? Need to understand the infrastructure required. How is this going to play into everything else I’ve got going on? There is no cookie cutter anecdote/advice we can give you for measuring success. Question – can each of you address ROI? Ardinger – it all depends on how you implement the solution. Webster – usually a company has their defined way of measuring ROI. Weinfeld – lots of data that you can capture, it’s all useful, but maybe not right away. What are the experiences that you want to create and what is the environment they’re going to be in? Traffic patterns. Lighting. Noise. Weather. Sometimes that might lead to a decision to not deploy a solution. You’ve got to be able to adjust based on the environment. At all costs. Market tests – important. Include them in your business plans. Do them as much as you can. If you don’t address the first 3, you’re going to get the technology wrong. It’s straight-forward getting the content to a display. There are so many different considerations that you must consider – indepth scheduling, having content react to data, management of sending content to multiple screens. How are you going to maintain and support the technology? A lot of times the IT groups do not have the expertise for these solutions. What about payment options? There are requirements out there. Have you taken them into consideration? Disability compliance, too. Bringing it all together – hopefully, this provides you a framework as you venture out on the showroom floor. This entry was posted in Digital Signage and tagged CETW, Customer Engagement on 11/09/2011 by Mike Cearley. Note – this dude is a heavy hitter and brought to life a great way of thinking about this wide, open space that technology and our world has given to us. This is a post that captures many of his thoughts from his keynote. The known universe – time, space, matter – in Future Perfect (Stan Davis), he says he wants to give new meaning to time, space and matter. This will require profound transformations in the way we think about these 3. When you have matter, you have no-matter. Matter is material things, no-matter is about bits. If there’s no-matter, then there’s no-space and no-time. No-space is virtual places. No-time is autonomous events. This now is a model about what is possible in today’s digital space. This is what he calls the Multiverse. This is not a plea to abandon reality. But there is a migration going on. More and more, people are spending their time in virtual worlds through screens. We can access virtuality through screens of any sorts. Virtuality is an experience that you have through any screen. You can have virtuality without digital technology. Think about books. Just from words on paper, you can create a world in your mind where that is taking place. Augmented Reality – this is the quintessential reality/virtuality example. It augments what you’re experiencing in the real world by giving you information in a virtual environment, typically on your mobile phone. Using digital technology to enhance the real-world. Showed a lot of examples of AR – Word Lens – real-time translation of your own language that you see, take a picture of. Pop notes – virtual post-it notes. Think of AR as a virtual prosthetic. Augmented Virtuality – interact with the virtual world from the real-world. Augmenting that virtual world. Some material substance that is controlling that environment. Look into this company – Personal Space Technologies. He also showed an example of Hallmarks cards that, to me, seem like Augmented Reality (not Virtuality??) He addressed this. So, what’s the difference? Primary experience is either in the real world (reality) or the digital world (virtuality). Interesting. I like it. Alternate Reality – alternate view of what’s going on in the real-world. Use the world as your playground (ARG’s). Alternate reality is no time. World Without Oil – HBR article by the author. We can use Alternate Reality as the new Business Reality. Physical Virtuality – design experience that becomes real. For example, take a digital picture of a physical space. Then, it turns into a 3D space. Now, use a tool to design how it should look. Then, you can make the furniture. Make it real based on the virtual experience that you have online. Your ideas can become real. Warped Reality – taking you into the past. Reenactments like the Civil War Adventure Camp. But what about the future? Not reenactment, but preenactment. 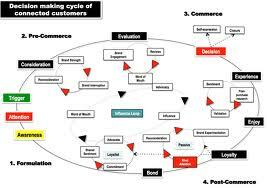 Starizon (company) – you determine what experience you want to have happen in the future and then they create it. Mirrored Virtuality – real-world experience & time tied into virtual world & time. Anything you can track is an example of this. Look at MLB.com and you can see what’s going on in the game, real-time via your computer. Tweetdeck – no real world component, but it’s mirroring what’s going on real-time in the Twitteverse. Some tips as you think about each one of these components in the Multiverse. Reality – shift marketing from advertising to marketing experiences. Augmented Reality – use smartphones to bring messages to customers when and where they most need it. Stop bothering them when they don’t need it. Alternate Reality – use the real-world as your playground for engagement. Warped Reality – get customers into the flow. Engagement them so much that all time goes away. Or help them envision their future. Virtual Reailty – shift your marketing dollars from advertisng to virtual marketing experiences. Augmented Virtuality – use customers own bodies to control what they experience from you. Physical Virtuality – mass customize your offerings – not just target your messages – to help your customers realize their dreams. Mirrored Virtuality – help your customers track what’s important to them in your offering category. And then give them a dashboard. The best offerings are those that do not live within one of these categories. 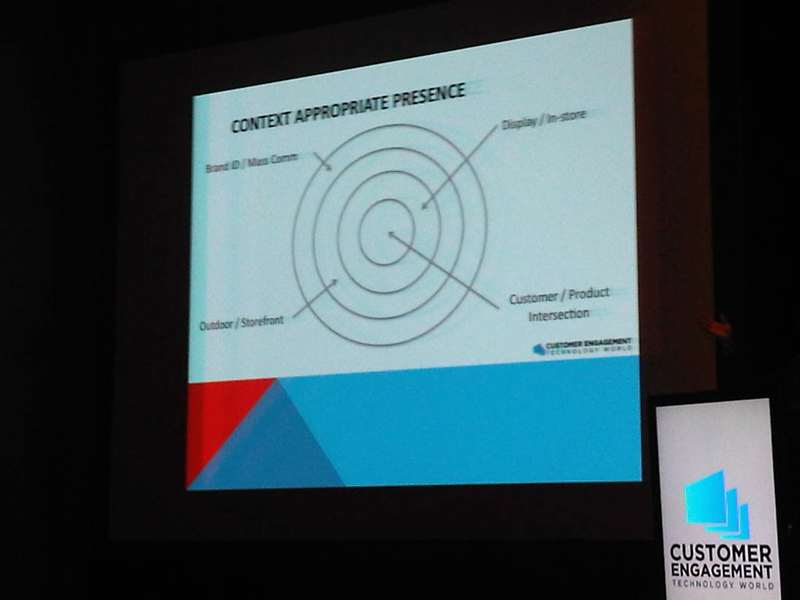 This entry was posted in Digital Signage and tagged Augmented Reality, CETW, Customer Engagement, innovation, Joseph Pine on 11/09/2011 by Mike Cearley. I’m headed to NYC today for Customer Engagement Technology World (CETW), which is being held at the Javits Center Wednesday & Thursday. In my opinion, it’s one of the best digital/interactive signage and emerging technology shows that no one knows about. The folks at CETW have done a great job of repositioning themselves and the conference to focus on engagement at the point of impact, across whatever channel/screen is available and utilized. They’ve moved it from being a show about the technology to being a show about what the technology can do. I’m not speaking this year, but am looking forward to seeing colleagues in the industry who are speaking and exhibiting. I will be giving a few exhibit floor tours on Wednesday morning and then introducing a panel in the afternoon. Outside of that, I just really hope to soak in all of the great information and perspective being shared. As I do at these things, you’ll get a lot of real-time “reporting” on the sessions I attend with a little bit of my own perspective sprinkled in. I’m really looking forward to it. I hope you enjoy it as much as me. If you’re going to be at the show, drop me a line and let’s get together for a chat. This entry was posted in Digital Signage and tagged CETW, Customer Engagement on 11/08/2011 by Mike Cearley. Thanks be to Some Pretty Awesome People – YOU! I’m riding the train right now, typing and watching all of the different-colored, half-leaved trees speed by me, and I’m reminded of how awesome this time of year is. It’s always been a time that we fall into our routines as a family (which is important for us), settle in for the upcoming season and year, reconnect with our families and friends, and get to see – visually, really see – how beautiful our surroundings truly are. This time of year always provides a nice centering for me because of all of these factors. This centering gives me the right perspective on what’s really important and meaningful. It allows me to reflect on those things that have blessed my life and to vocally be thankful for them. No doubt, I have lots be thankful for. My family and friends and our health top the list. I lost a teacher and mentor yesterday, and I’m thankful for all of those who have taught and purposefully (or non-purposefully) mentored me. Over the years, I have learned from many people and they have collectively given me the knowledge, confidence, guidance, and experience that have enabled me to get where I am today. I can only hope to have a fraction of the impact on others as those have had on me. This blog is another thing I’m thankful for. It’s a labor of love for me and I’ve enjoyed every minute of it. It would not be what it is, though, without you guys, my readers. 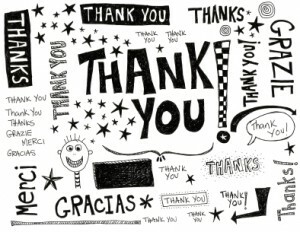 So, the biggest THANK YOU goes to YOU. You have shown interest by reading and providing comments and some of you even come back a second time. :) It’s really humbling. Your readership gives me reassurance that I am providing some sort of value to you. I only hope to continue, and ideally, get better. I’m always open to thoughts and suggestions on how to make this better for you, so please feel free to share. I feel like I’m just getting started. I have to also thank my boss and friend, Matt Dickman, for encouraging me to start this blog. Without his support, I would have never started it and without his advice, I wouldn’t know the real “right” way to approach and do something like this. He encourages me unconditionally. He’s a great mind and I’m grateful to be working right along side him. To that end, I’m privileged to work along AMAZING people who are committed to doing GREAT work. Brad – your help and insights have given me inspiration for pushing. Spike – your perspective is fresh and gives me courage. Herb – you’re wicked smart and you push me in ways I don’t like to admit (especially to you). Miker – you’re a rock, dude, and have been for a LONG time for me. Oh yeah, you’re super-talented at that video thing. Cindy – you keep us in line and strive to do what’s right. Sarah B. – you jump right in and aren’t afraid to mix it up. Most importantly, you want to get better. Chrissie – you’re a sponge. Keep sponging. Sarah F. – your drive is amazing. Aly – you just get stuff done and are a pleasure to work with. Clare – I can tell we’re going to get along just fine. Welcome to our team. Warren – you’re calm under pressure, brother, and your level-head sets a great tone. Rob – you think things through like a mad man and your edge levels that tone out. Ryan – your flexing is powerful. And I’m not talking muscles. Christian – does that smile ever leave your face? Matt W. – it’s been great to see you open up and you add a pleasant, chill dimension to the team. Abby & Lane – you’re machines with that research. And Chris – you do your thing, you bring quality thinking in everything. Inez – you’re the backbone of our group. Most of all, everyone’s just nice. And that’s nice. Thank you all for being who you are and doing what you do. Outside of work, specifically inside the “industry,” I also have many people to thank, starting with the leaders of the two large industry (DOOH) conferences. They have both been incredibly generous and kind to me. Geri at the Digital Signage Expo (DSE) really gave me my first “break” in this blogging world. She gave me behind-the-scenes access that exposed me to things and people that I wouldn’t have otherwise been exposed to. Early on, in the life of this blog, she provided a source of great momentum by taking a chance on “the new guy.” And Lawrence at Customer Engagement Technology World (CETW) has been extremely gracious, too. In his time, his open ears, and his access. He’s also given me the opportunity to speak at both of his shows this year. For all of that, thank you both. You’re unsung heroes of this industry and I am honored to have gotten to know you, work beside you, and help you get the word out this year. I’ve also had the good fortune to meet and become pretty close to other industry leaders. Dave Haynes and Paul Flanigan – two rock stars in this industry with LOADS of experience – have treated me so well since I met them. They reached out to me like a friend, as if we’d known each other for years, and have made it comfortable, and even more, insightful, every time we interact with each other. We’ve had many great conversations, and I hope to have many more. They’ve been instrumental in sharing my thoughts with their personal communities and have both opened up opportunities for me that are invaluable. Another one is David Weinfeld, a kindred spirit. David runs in the same group as Dave and Paul, so it was a package deal – (along with Pat Hellberg) I got to know them all in one fail swoop. David is passionate about this space and the potential it provides and works tirelessly to advance the knowledge, capabilities, and power that technology enables when people are on the move. He’s become my Twitter BFF. The last guy in that group is Pat Hellberg. Although I’ve spent limited time with him, the time that I have spent has been rich. He’s a video guy and a Nike guy. Both awesome in my book. I was in Portland earlier in the year and he spent a few hours with me and showed me around his old stomping ground – the Nike campus. It was one of my “industry” highlights of the year. Adrian and Gail at DailyDOOH have also been kind to me, welcoming into the small world of industry bloggers. They are the premier news source in the industry so it’s been cool to get a glimpse of their world and how they operate. Ken Goldberg, Keith Kelson, Kyle Porter, Stephen Randall – thank you for your openness in our conversations, and more importantly, your leadership within the industry. And there are, no doubt, many that I’ve probably missed. It’s been a rich year to be sure. Not only for me, but for this industry. Regardless of our view of Out-of-Home or Digital Out-of-Home or Digital Signage, we’re all working together for the same thing – to advance the knowledge and the potential of this powerful medium. I see great things in the future for this industry and I’m glad to be part of it. Thank you all, again, for your part in this. Thank you for reading and sharing. I hope you have had just as rich and rewarding of a year as I have and I wish each one of you a Happy Thanksgiving and holiday season and a prosperous year to come. This entry was posted in Digital Signage and tagged CETW, Digital Out of Home, Digital Signage, DSE, Out of Home on 11/24/2010 by Mike Cearley.